One of the most difficult aspects of working in a school or in a non-for-profit school in Africa is the constant feeling of wanting to do more. I am constantly bombarded with the feeling of “if I could just change this one thing…” I have realized over the years of my service here that there will always be another thing to fix, another person to help but I still can’t help the feeling. Because of the structure of our school, the nature of schools in Tanzania and my own limitations of not knowing too many certified teachers in Tanzania we went two months without a full staff. Finally this problem was remedied last week, which means the teachers are all making it to their classes, but we can never get back the time we missed. To me, as an educator and a person who cares deeply about my students, my children I found that to be unacceptable. For two months I was stuck wondering when we would meet our responsibility to the children. We can all rest easy now knowing that our staff is complete and look towards the future in establishing the processes and expectations that are required to be met. I will however continue to push on behalf of all of you at home to constantly be the “fire” that lights them to try to do their best. Of course there are many bright spots coming out of the past couple weeks. Our library is currently being renovated by our outstanding volunteers Katie and Joost. We will have a constant reminder of their impact and role at our school and how we benefited from their work here. They have painted it with an “around the world” theme and with the help of Joost’s friends in the Netherlands will outfit the library with some brand new furniture. Additionally a University student from South Carolina, also named Katie, has started a University book drive for our students focusing on early and emergent level books to fill up our library. It seems the children have found a way to inspire every person they come in contact with, by inspiring them to do more. Our next step will be adding computers (when we have some generous donors donate more…) so that our children can truly connect to the world and those who have helped them. The children have very little concept of the outside world, or even their own country outside of Mailisita. With the help of these resources they will be able to finally reach out to the world and discover it for themselves. As I have still been slowly recovering from malaria, you will all be happy to know that I am finally able to exercise again. Those of you who know me personally know how important that is and probably feel very sorry for those who were forced to be around me when I was not working out. Believe me, the staff and my friends here are all breathing a sigh of relief, because I can imagine that I have been a bit on edge lately. Case and point was when the workers decided to start burning the trash at 8:30 in the morning during my first period English class which resulted in smoke filling my P4 classroom. That lead to me storming out of class, finding the construction worker and apparently raising my voice enough in “disappointment” that the children heard me. The moment I returned to the class my children all laughed and said “sorry sir!” I pride myself on not ever raising my voice in the classroom so it was certainly the first time they had ever heard anything like that from me. On the plus side, we established a ground rule, ‘no burning trash during school hours’. A problem that we would not encounter in the States, but luckily a problem we will not encounter at Stella Maris again. Even during this trying beginning of the year, the children still remain the example in patience and happiness in our project. They make many mistakes, do not get me wrong. They fight a lot, they argue with one another and they still have friendship drama (especially the older ones). They still find a way to remind us all that they are just as loving and funny as ever. One small problem I have been noticing when I come home is that I end up with small red stones from our playground in my pockets. I had no idea how they got there and it seemed impossible that they would end up “jumping” into my pockets. Every day I came home, took out my keys and these little stones would fall out. It was usually just one or two very small stones, but enough that I noticed a pattern. It wasn’t until today that I realized who the culprits were. Two of our P4 children, Witness and Dennis have been working together to slip these small stones in my pocket almost every day for about a week and then sneak off to laugh. I never noticed, but they would come up and start to talk to me. When I was occupied one of them would put them in my pocket as a few children would sneak off to laugh. Yesterday however I caught them red handed as I felt a little hand get too greedy trying to slip multiple larger stones into my pocket. I grabbed the hand, whipped around and found a whole group of P4 students laughing as Dennis screamed with laughter right in my face. No one will ever confuse me for being the smartest man in the world, but it was only today that I realized that I must have been teaching them too well, they have already surpassed me. I immediately felt guilty for the time in high school when I snuck a powdered donut into my teacher’s closed coffee mug. Now I understand the feeling, too bad it was a 10 year old who tricked me. I guess I realized how lucky I am to have so many people in my life that support me, the work here and the children I love. Katie in South Carolina, Katie and Joost volunteering here, my friend and mentor Adam, the Mailisita Foundation board and my friends at home who send me messages and emails of support. You are all always patient with me as I respond, slowly and constantly remind me of the example I should be. I will always find a reason to laugh and enjoy the children, but I must also be patient as the adults grow too. Our project is growing, we have overcome many speed bumps and will encounter many more, but I will remain patient and loving. You all have always been that way with me, thank you. God bless. Over the past couple weeks I have seen more acts of compassion and heard more words of encouragement then I have at any point during my work in Tanzania. Thank you to everyone. The outpouring of support and love has absolutely spurred me on and kept me going during one of the hardest points of my stay in Tanzania. Malaria is no joke. Teaching with malaria is also no joke. Outside of a day and a half where I was suffering from malaria and the flu concurrently, I simply could not find a reason not to teach my classes. Every morning and night I had new messages of support from home from my friends or family and all day long I had the help of the children to keep me going. Their ability to empathize with me was incredible from the moment of the “I have malaria again”, class responds “ooooohhhhh noooo, soooorrryy” to the everyday lessons for weeks. I have never had such quiet classes in my entire life. They all sat, at attention, silently and even began to police their friends who would talk during class with reminders of “don’t disturb Mr. Terry, he is sick”. It kept me laughing all week and most importantly kept me in the classroom. As soon as I had finished my classes for the day I would drag my feet home, plop down on bed and sleep for four or five hours until dinner. I would then wake up, eat and go back to sleep until the next day. You cannot imagine the physical exhaustion of malaria until you experience it, and even now looking back on it, it seems unreal. The weeks have been a bit of blur to be honest but I definitely still had my highlight. It started on the Monday after my birthday with the simplest of gestures. Siggy, a student in P4 had asked his parents for money, went to the store and bought a Birthday card. He had every child in P4 sign it without me having any idea. In the afternoon I was already exhausted, dragging a bit and mentally drained when I entered the P4 class for their second English lesson. Siggy stood up, walked to the front of the class with the card in hand and I asked him “what’s up Siggy? What do you need?” I will never forget his words, “Mr. Terry this card is for you. We were in P1 for your birthday too. We are now old and we are getting old together. We are happy you are here with us.” Siggy said this as he looked at me, then at the ground, and then back at me. I noticed he was tearing up. He understood his words and could see that they were impacting me and I could see that he meant them. I then stared at the ground, teared up, looked at the card, and then at all the children. Some of the children avoided making eye contact, and others just stared back with soft smiles. They were all looking at me and waiting for me to talk, while I searched for the right words. So I told them the truth “This is my favorite card, ever. I love you all more than you will ever know.” Then Lidia broke the silence and the tension with a loud “We love you too!” which made everyone laugh and thankfully moved our class along. That moment, the thought he had in buying the card, getting everyone to sign it but most of all his words will always stay with me. I realized my responsibility as a teacher, an adult and a leader of children is to sometimes do what is most difficult in a given moment. We have made it so hard in our world to open our hearts. Everything from fear of rejection to social anxiety to peer pressure has conditioned us not to share our thoughts and feelings. We routinely joke about or call attention to displays of love in our media and call it “corny”. We “play it cool” around others rather than share our thoughts. Most egregiously we allow others to pass in and out of our lives without telling them how they make us feel. As a result we close up, share less and less, and become less honest. For four years I have told these children I love them, care for them and that they are special to me. I know they will close up significantly, and some already take considerable effort to ‘crack’ their exterior. There are many forces in their worlds far stronger than me. I have learned that I can control my own example. Even though they are getting older and begin to close up themselves I will still tell them how special they are. 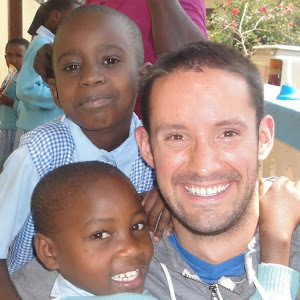 How they made a sick man feel better and helped me through malaria. I will still try to make them smile everyday whenever I can. I will still tell them I love them. So that there will still be at least one very sensitive young boy, with a whole lot of love, who knows it is ok to open his heart, even when he grows up to be a man. So obviously I have already told everyone, but I have malaria again. It is the third time in my life that I have gotten malaria and I blame malaria (and Catherine) for my grey hair. It is right above my right ear and I am certain it wasn’t there until after my first bout with malaria. Malaria is an interesting sickness. It is certainly the worst sickness that I have ever had, but I have become accustomed to noticing its symptoms. I was quite certain of my most recent infection for about two weeks. I mentioned to a friend a week before I was ever diagnosed that I felt “off”, my stomach was swollen and I was tired. I figured that I had malaria again, but was too busy to go to the hospital and most of all I didn’t want to start the treatment. Malaria gets a whole lot worse the moment you take the medicine and your body becomes truly depleted. The symptoms are physical as well as mental. I know you all can google malaria and read about it so I won’t get too detailed. The symptoms are a bit like combining the flu with mononucleosis, and then making the symptoms more severe and last for even longer. Some of the more unique symptoms are night terrors, loss of consciousness, and abnormal behavior. The parasites will infect every part of your body that uses blood, so it is pretty rough. For example, in the one drop of my blood the nurse took, she recorded 4 parasites living happily and infecting my red blood cells. It’s because of this that malaria is the deadliest infectious disease in the world. Let me be clear that I am certain that I will recover fully. I am a healthy enough young man with enough money (in this case $8) to pay for my malaria treatment. I have also been infected before so I understand the symptoms as well as have some experience with this sickness. So thank you so much for the outpouring of support in emails and messages, but honestly I will be fine. I will write a bit about what it is like teaching while being sick with malaria next time, but I wanted to go back to my birthday weekend. On the Sunday of my birthday weekend I went over to the children’s mass as was usual. I then made my way to Catherine and Stivin’s home for lunch. When I arrived their grandfather, Baba Makundi wanted to take me with to visit a sick grandmother. He told me that her granddaughter was a little younger than me and was trying to take care of the grandmother, but was struggling because she was sick too. So we walked for about 30 minutes to their home. Since I had already started my medicine for malaria and it was so hot, I was a bit tired already when I arrived at the home. My head was cloudy at best and I couldn’t quite remember all the details of why we were there other than to greet them. So we sat down together me, Baba Makundi, Catherine, and the grandmother. In the typical Tanzanian fashion they welcomed me with a gift to thank me for visiting them (they gave me a fresh piece of sugar cane). So we were all sitting together and a young woman carrying a tiny baby joined us. She sat down next to me on a bench, smiled and then immediately put her baby in my arms and relaxed against the wall behind us. It was the smallest baby I had ever seen but she smiled beautifully as she looked up at me smiling down at her. She opened her mouth and made a small squeaking noise that made us Catherine and I laugh as we played with her. Her mother was a bit younger than me, but strikingly attractive. God has truly blessed the people of Tanzania with beauty and this woman was even more beautiful than most. The young woman and I talked for a little while and I learned her baby was 2 months old and I was the first “mzungu” (white person) that her baby had seen. I was also the first white person to enter their home which tends to be the case with most people I visit from Mailisita. We talked for a while about the project in Mailisita, and continually thanked me for my work. After, they explained their hardships, but expressed hope that they would be healthy again soon. Then after praying together for a short while (the grandmother is too sick to go to church but wanted to pray with someone) we said our goodbyes and promised to see each other again soon. I gave the young woman her baby who was fast asleep in my arms and told her that I looked forward to talking to her again. It was a rather normal home visit, as it was one of three that day, but during our walk to another friend’s home Baba Makundi filled me in on more of their story. The beautiful young woman I met was the grandmother’s granddaughter, she was 21, and had HIV. So did her beautiful young baby that I was holding in my arms. I realized very quickly that every second I spent feeling sorry for myself about losing my muscles, being tired, having a fever and aching with malaria I had forgotten about my neighbors. I forgot how people in our village were dealing with the same illness without medication or inferior medication. I forgot how people in our village were dealing with far more serious illnesses, ones without cures. I forgot most of all that there are children and babies born with illnesses that leave them little hope or chance to survive. I had my moment of self-pity washed away from the realization that the beautiful young woman and her child who I fell in love with and connected with, were both afflicted with HIV. This is our reality and these are our neighbors. This is where our students come from and the reason for our school. This is why we all come here to help and serve and why every day is a gift, because no matter what the situation we must find a reason to smile. We may never know what that smile will mean to another person or what sharing a smile may represent. For that baby her smile will always remind me of hope. I have seen it in my sleep and I think of it every day, and when I saw Catherine smile looking down on that baby, saying hello and speaking English to that baby I realized she is the embodiment of that hope. She is hope in form, because Catherine and all children are our future and their intelligence and compassion will lead us forward.